Make the effort and 'go west': you won't regret it! Western Mongolia tours: is is worth it? Yes! I know it takes a bit of money (i.e. flights) or time (i.e. overland travel) to get out to Western Mongolia, but I really think the West is the best part of Mongolia. The whole place is such a world away from home that you'll feel like you're living in a National Geographic special. Having spent a few years traveling the world, I get less of those 'Wow' moments these days, but the West really blew me away! Over 1,600km from Ulan Bator, and hemmed in by the Kazakh Altai mountains, Russian Siberia, and Chinese Xinjiang province, it's remote, undeveloped, and a bit harder and more expensive to travel in..... which is exactly what makes it so special! The Tavan Bogd area truly is one of the world's most special places -the scenery, the culture, the remoteness... wow! You can read all about the West's attractions on my Western Mongolia page, but suffice to say there is a lot to see! You really will have an unforgettable time. So get yourself there, before everybody else does! Can you recommend an itinerary? How much will it cost? I get this question from a lot of people, so I decided to put together a recommended itinerary, in consultation with Bek (see below), for a 10-day trip which covers all the best bits of Tavan Bogd and surrounds. There's one itinerary for a West Mongolia horse treks, and 2 West Mongolia hiking options. There's also pricing which Bek can offer for these trips. 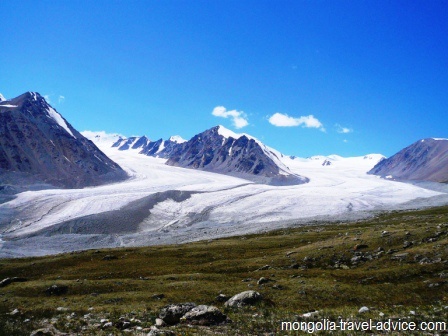 You can see all the details on this tour Tavan Bogd itinerary page. Tavan Bogd; and not another soul to have to share it with! Over a thousand miles from UB, with a different language, the amazing West Mongolia might as well be a different country. Most UB-based Mongolian tour guides rarely even make it out west, and don't know the region. If you take Western Mongolian tours with a UB-based guide, it will be like being lead around a country by another foreigner. A local outfit is particularly important in Bayan Olgii aimag (the highlight of Western Mongolia and home to Tavan Bogd National Park, eagle hunting, and a unique Kazakh culture) because 90% of the inhabitants speak Kazakh, which most Mongolians don't know. Bottom line: If you're going to Bayan Olgii, you need a Kazakh guide. Of course, always go with a Mongolian company rather than a foreign-based company, who will just take a huge margin and sub-contract the work to Mongolians. Because relatively few tourists make it out West, there are only a small number of local operators who run West Mongolia tours. 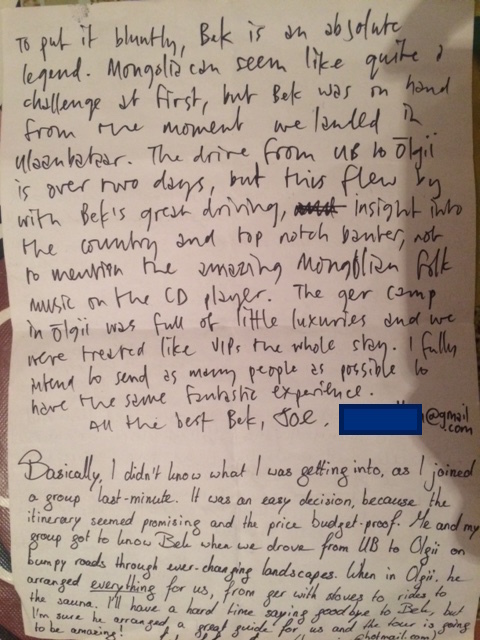 'Blue Wolf' tours was the most established West Mongolian tour company, but they have really gone downhill in the last few years and I've received negative reports from both local guides who don't get paid and tourists whose expectations aren't met. I would not use them myself. There are only a handful of other companies which are actually based out West. On my West Mongolian tour, I went with Aynabek "Bek" Habduali, who runs a one of the more popular tour companies. Bek is an ethnic Kazakh, born and raised in Bayan Olgii. He now spends time between Olgii and Ulan Bator. Having contacts both in the city and out West, he's the ideal person to arrange western Mongolia tours. 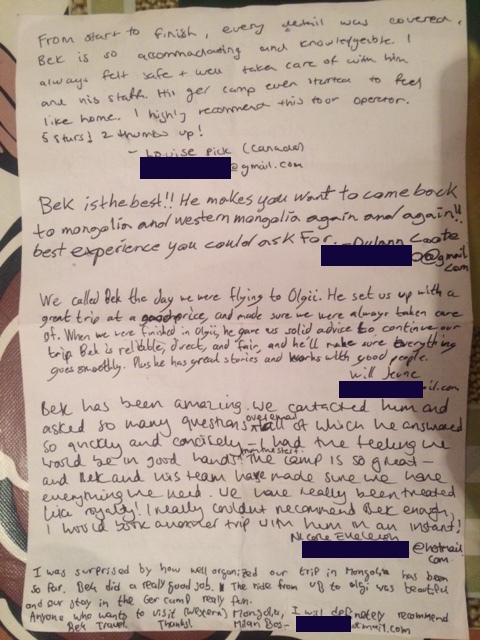 Bek's a good, honest person; he treats his guides well and we've became good mates after my last trip out West. Bek can arrange hiking, vehicle, and horse riding tours of West Mongolia which represent great value for money. If you're considering a west mongolia tour, read this essential guide here. It includes some possible tours and pricing for 2019 Season. See it HERE. You can then use the below form to Contact Bek and make an enquiry about costs, logistics, etc. Back from my Western Mongolia tours page to my Western Mongolia page.